For their millions of fans around the world, twin brothers Jonathan and Drew Scott are masters of the impossible – finding and transforming ordinary houses into stunning dream homes on their megahit HGTV show Property Brothers. As hosts of multiple top-rated series on HGTV including Property Brothers: Buying & Selling, Property Brothers at Home and Brother Vs. Brother, they entertain millions of fans with their winning blend of sibling rivalry and humor. Now fans can experience the duo in person during a stop on their nationwide tour, The Scott Brothers’ House Party, presented by HGTV. Inspired by their new memoir, It Takes Two: Our Story (Houghton Mifflin Harcourt – on sale September 5), Jonathan and Drew’s House Party tour offers fans an uncensored look into their lives. There will be plenty of audience participation as they breakdown their do’s and don’ts, share the wisdom they’ve gleaned as entrepreneurs, and reveal all the hilarious moments that don’t make it onto television. Door prizes, impromptu design consults, behind-the-scenes bloopers, and plenty of laughs will round out this fun evening with Jonathan and Drew. Jonathan and Drew Scott, known for their wildly popular HGTV shows including Property Brothers and Brother Vs. Brother, follow up their New York Times bestseller, Dream Home, with a highly anticipated memoir. 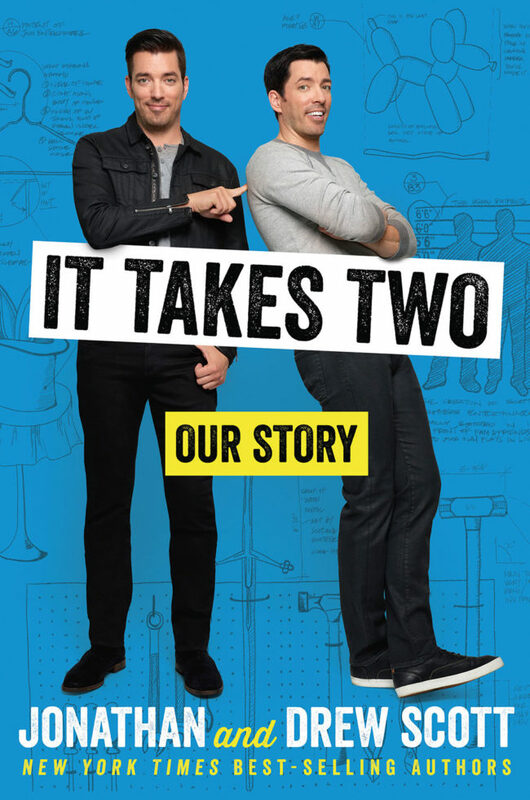 It Takes Two: Our Story shares never-before-revealed tales of the brothers’ childhood and rise to fame – from starting their first business at 7 years old and their years modeling and acting, to their first house purchase at the impressive young age of eighteen. They soon found their true passion in life, combining their natural gifts for entertaining with the skills they learned from buying, renovating, and selling homes. Entrepreneurs, TV personalities, authors and recording artists, twin brothers Jonathan and Drew Scott are co-founders of Scott Brothers Entertainment and Scott Living. With offices in both the U.S. and Canada, Scott Brothers Entertainment produces award-winning and engaging content in all genres for TV, film and digital platforms. Scott Living, a designer collection of indoor and outdoor furniture, décor and bedding is available at a variety of North American retailers including QVC, Costco.com and Lowe’s. As TV personalities, the Scott Brothers’ series are enjoyed by millions of viewers in over 150 countries. Recent musical endeavors include the release of multiple singles and inclusion on the Billboard’s Top Country Chart. Their inaugural book, Dream Home was a New York Times and Wall Street Journal best seller.